National Geographic tornado research operations day 11. 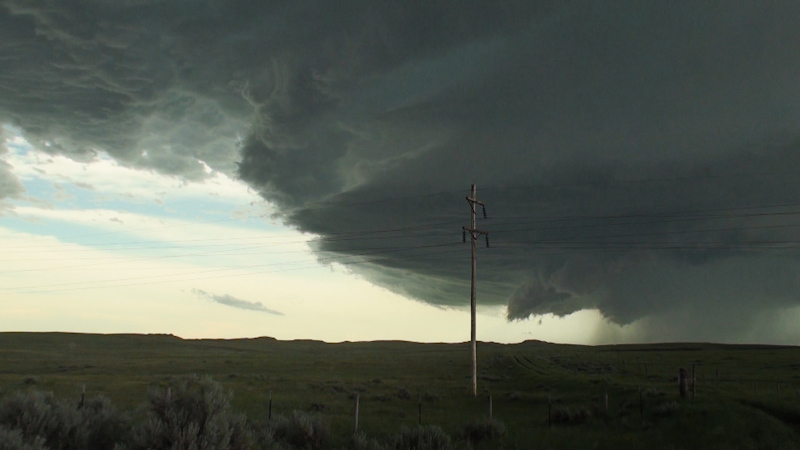 Targeted High Plains supercells in eastern Montana, intercepting near Jordan, MT noting wall cloud. 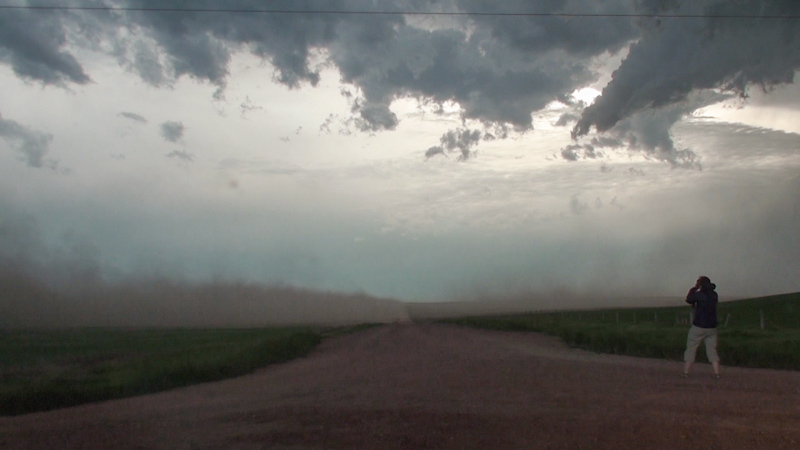 Tracked tornado warned storm to ND border encountering massive dust storm before ending at dusk as storms dwindled. "Morning Outlook Day 1: The morning places a strong low over northern AB/SK, with a trailing frontal complexity and several lee lows into the US. An approaching SW trough will promote deepening of the surface low, with a right exit region over south SK and northern ND. This places for the first time in a few days, sufficient wind shear to promote strongly rotating storms over the Northern High Plains. There are four potential targets this morning, though as Skip alludes, the warm frontal play appears to be out of reach for the Canadian teams and messy. Targets 2 and 3 remain in play, though it would appear target 2 in the border region (MT/ND/SK) is more favorable in terms of recent CAM runs and moisture. That being said, it appears the models have overcooked the moisture advection in prior runs, providing more than is really evident on the morning synoptic chart and making some rather gross evapotranspiration assumptions (GFS/NAM). However, CAM runs seem to be holding pretty close to the moisture scenario this morning, suggesting that there is still a potential for supercells, with a favorable parameter space in terms of both moderate VWS and instability in southern SK/northern ND. While dew point spreads are a little larger than I would like to see for an optimal large tornado number setup, and hodographs not quite as long as initially progged, there still appears to be a reasonable shot at tornadoes in the target region. The 3rd target does appear also to be viable for initiation, though higher bases appear likely, as does upscale growth further southwards. That being said, the 10Z/11Z HRRR runs develop several supercells in the North Dakota/MT border region which appear to be a favorable target for team Duck, though these have shifted more northward in recent runs, leading to initiating concerns as mentioned by Skip due to the fearful capping. However, a 4th target also exists - the post-frontal play. Airmass recovery over MT will yield 1000-1500 J/kg of CAPE within an environment characterized by 40-50 knots of deep layer shear, and unidirectional upslope flow trajectories with low 50s moisture and imitating around 19-20Z. The strong degree of speed shear will promote relatively rapid moving but strong updraft rotation, as alluded to by both HRRR and NAM CAM runs as of this morning which develop strongly rotating supercell echoes. While supercells will initially split, it appears right movers will track effectively NE, a boon with the road network issues in the state. These cells will move toward the ND/MT corridor for later development, and likely cause upscale growth as the two storm areas merge, producing a large MCS. SPC has deigned to place a 5% tornado risk in this region. In light of this scenario, my initial feeling is that teams Turtle.5 and Woodchuck would be best served by the Canadian border region target unless they feel otherwise, while team Duck would benefit from the less conditional and close to the border target 4, going after the MT storms. Day 2: Another bifurcated target scenario. One target is over the MN/ND/SD border region, and will likely realize a rapid upscale growth and formation of a large MCS that will travel Seward. In light of strong shear storm motion will be fast in this region, and in light of day 3, would recommend against pursuing this. The second target lies in north central MT where a strong potential for supercells will exist near the Great Falls, MT region and points north and west. NAM4km develops several supercells with significant rotation in this area, agreeing well with the SPC marginal risk region. Day 3: Increasing moisture return will yield another supercell favorable environment in NE MT/NW ND and southern SK. A stationary boundary seems to set itself in this environment, and with moderate instability and appreciable VWS, this appears likely to yield supercells capable of all severe risk, with an increasing tornado threat as the LLJ strengthens. Day 4: Probably somewhere in the high plains. According to SPC 5-6 (and Euro): Maybe finally the ridge breaker in the central plains. " 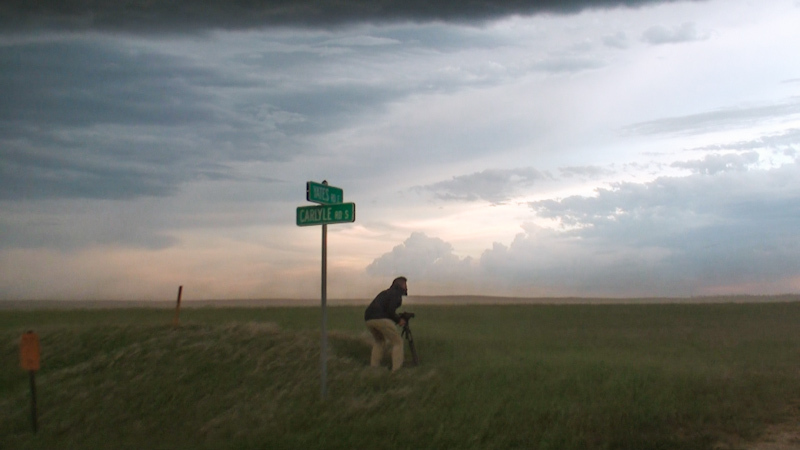 Day 11 on the Great Plains looking for tornadoes with three teams of tornado chasers/atmospheric scientists. 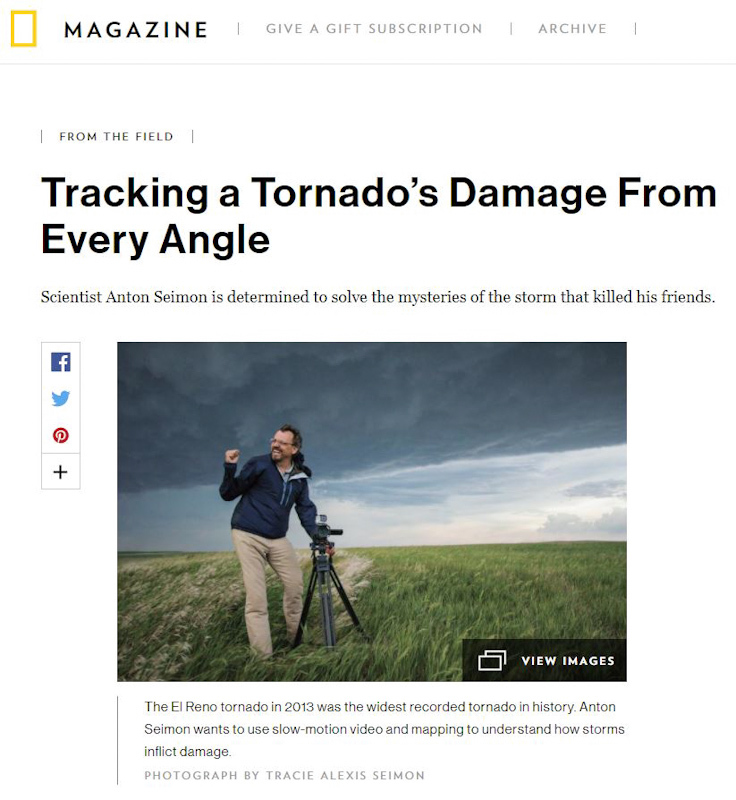 We were on a National Geographic funded project led by Anton Seimon and John Allen studying tornadoes using multiperspective video, a continuation of the work we did with the El Reno Survey. We hadn't seen a decent supercell in days and thousands of miles. Today looked like a chance somewhere in eastern Montana or southern Saskatchewan. We were leaning on the Canada target initially, and I was pretty geeked because I hadn't really chased Canada before. We were also scheduled to pick up Anton and Tracie's friend Tim Currie. The plan was to have Tim drive the van with me, and Brindley shoot pictures with Team Duck: John and Rose Allen. They'd get on the initial storm activity forecas to go up earlier in eastern Montana while we tried the Canada play up north later. I said farewell to Brindley as she headed off with John and Rose, and then I took off solo north out of Dickinson, ND heading for Williston. I got to drive through the Theodore Roosevelt National Park which was super pretty. I rendezvoused with Anton, Tracie, and Tim at the Williston airport. The town and surrounding area are bustling with the North Dakota oil boom. We caught the storm in Jordan. 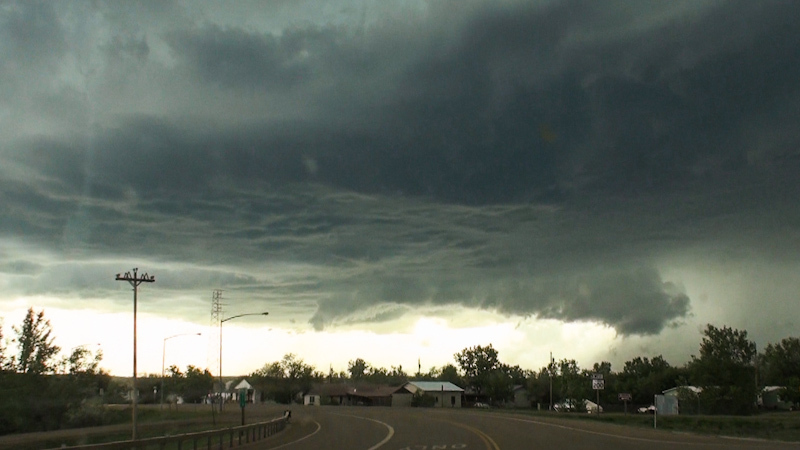 The high based supercell was sporting a wall cloud and textured base. We hurriedly got gas at the Cenex in town, pit crew style, hoping to beat the storm before we got blasted by hail and severe outflow winds. We tracked the storm east for the next several hours over the wide open Montana terrain. The sparse roads usually kept us from getting too close, but the unpaved ones were in good condition and allowed for great views. The storm picked up a tornado warning, although it looked incredibly high based due to the low dewpoint air way up in the northern High Plains. 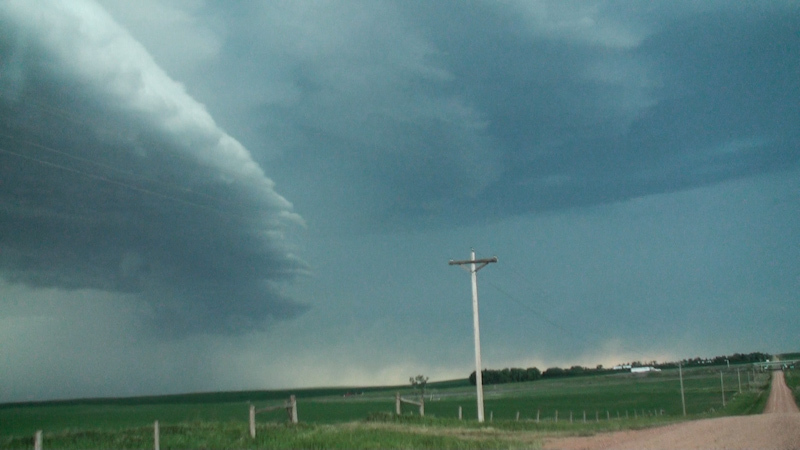 It was a gorgeously striated supercell, however. 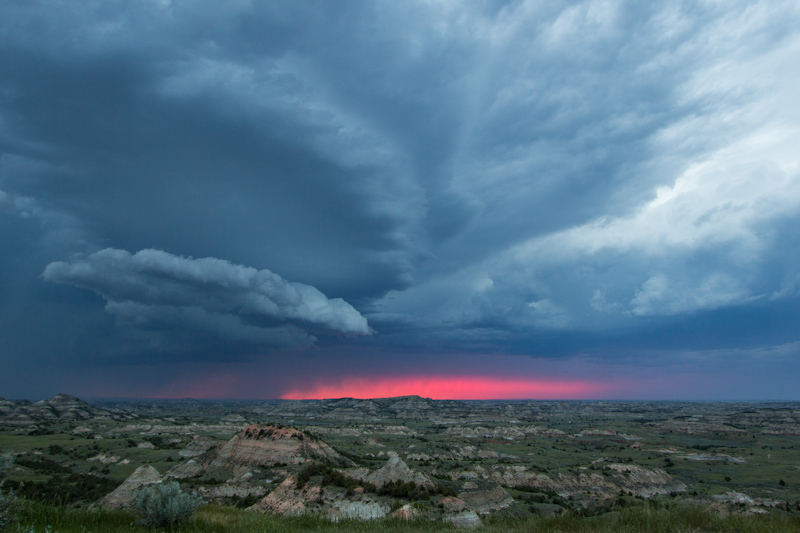 We tracked the storm all the way to the North Dakota border where it looked like it was finally starting to die. The base retreated and started to erode, but the evening light painted it in really pretty blue shades. I stepped outside of the van to experience the storm with the rest of the team. Big Mistake. 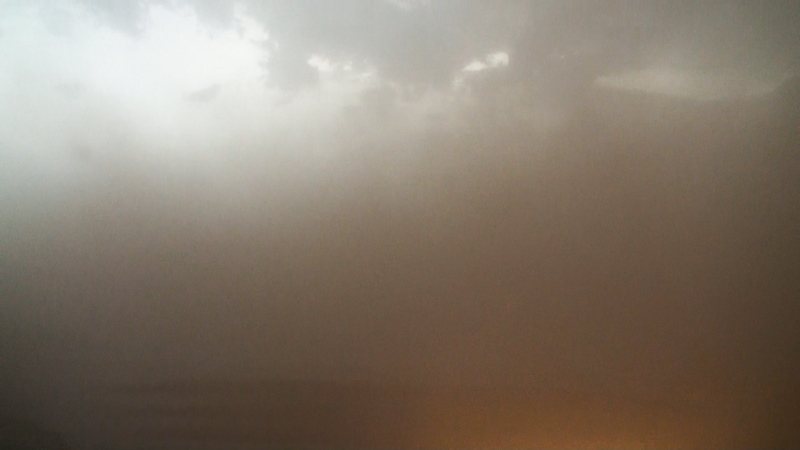 The dust storm hit head on with tremendous force, the hot dust sandblasting everyone in the face. I ducked behind the van for cover, before moving to get back inside. I had to shut my eyes against the dust, and feel my away along the side of the vehicle blind while holding on to stay up in the wind. Visibility was zero once I made it back inside, the van rocking in the outflow. Winds went well over the severe threshold. Bits of small debris were whizzing through the air and rolling along on the ground. I had lost sight of the team, still trapped outside, and was genuinely concerned for their safety at this point. I saw Anton emerge from the dust first, braced with his back to the wind and huddled over his camcorder. I called out to him and he was totally ecstatic, envigorated by the storm experience. When the dust cleared I stepped outside, the outflow winds still howling. 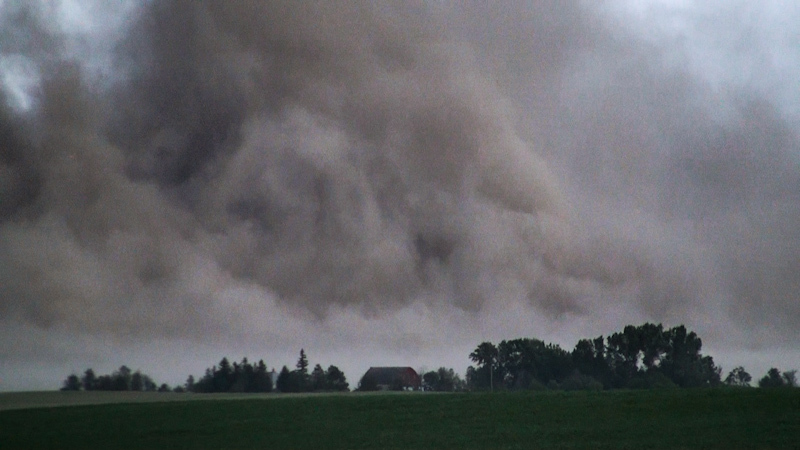 The dust storm had grown into a massive wall on the eastern sky as it moved away from us. The scene looked apocalyptic. 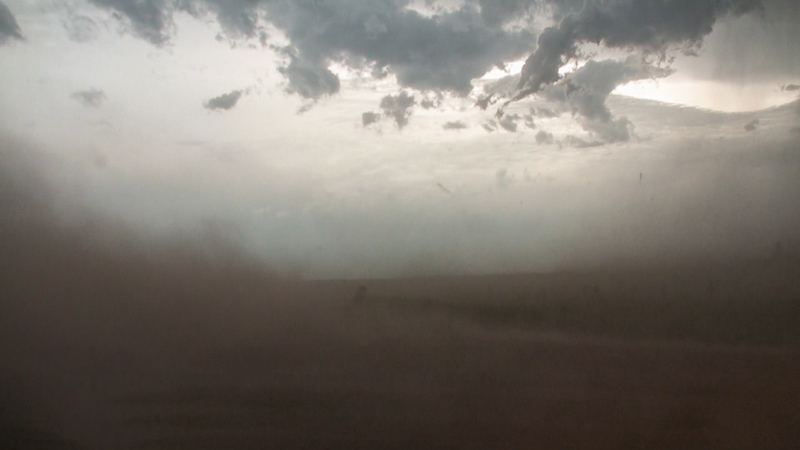 The dust storm continued to fan out and race off to the east, the beginning of what's called a haboob. We stayed for a few minutes before getting on 94 east to track other area storms. At dusk we stopped at a scenic overlook in Theodore National Park with other storm chasers. The view was surreal. Deep blue storm clouds spanned overhead, while hot pink setting sunlight filtered through a crack in the bottom. As it got dark and the storms continued to dwindle, we called the chase. Tim hopped in with Anton and Tracie, and I did a long trek solo back to Miles City, MT to meet up with John, Rose, and Brindley. "Clear skies greeted us this morning with cirrus to the west as we set off westward bound, with Jenn also joining us for the chase. Moist upslope flow was expected to develop on the lee side of a low in southern Canada in a post frontal recovering air mass. Flow trajectories were from the northeast, though relatively weak, with southwesterly upper level flow. A boundary stretched from the Missouri River basin southwest through the Little Snowies toward far southwestern MT, and in conjunction with a shortwave trough approaching from the west and upslope flow, our initial target was aroundabout the northwest of Roundup. Dew points were in the low 50s, with CAPE between 1500-2000j/kg. Vertical wind shear was between 50-55kts over our target, though low level helicity was somewhat limited due to northeasterly surface flow and an absolute transition of winds rather than backing. Initial storms developed over the Little Snowies along the boundary and were visible from more than 150 miles away. The first cell was spectacular upon approach, with explosive updrafts and impressive overall structure. Intriguingly, as we approached this storm, the anvil from the storm to its west which had begun its life in a more multicellular structure, interacted with the updraft tower of our storm, ingesting the flanking line and chocking it off. This second cell became dominant, and tracked towards Valentine MT. We observed its approach on the Winnett-Valentine road, with the storm cycling and becoming progressively more structured. As the storm had formed a substantial wall cloud and was displaying the characteristics of an RFD cut, we positioned for a potential tornado directly east of the area of interest. 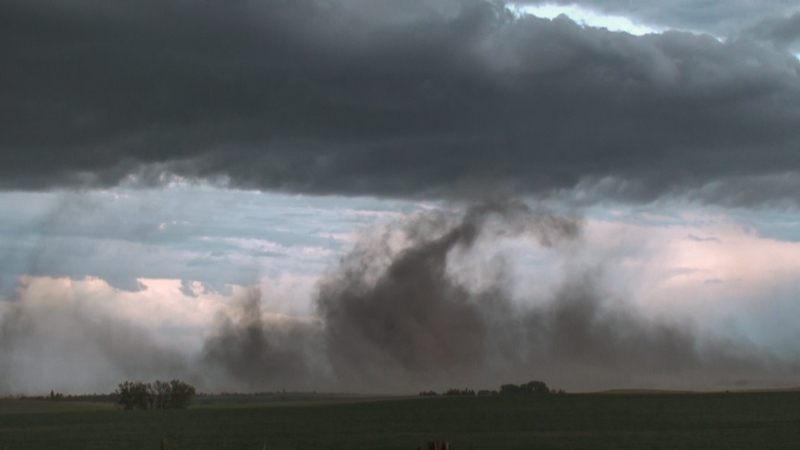 Unfortunately, while there was circulation, it was insufficient to condense a tornado during the period of observation. However the structure of the storm at this point was quite attractive, as was its surging rear flank downdraft. Several large CG strikes behind our vehicle and the surging RFD prompted our exodus, where we drove eastward from Winnett towards Jordan to regain position and angle on the reconsolidating storm, which had now accelerated and was moving almost due east. 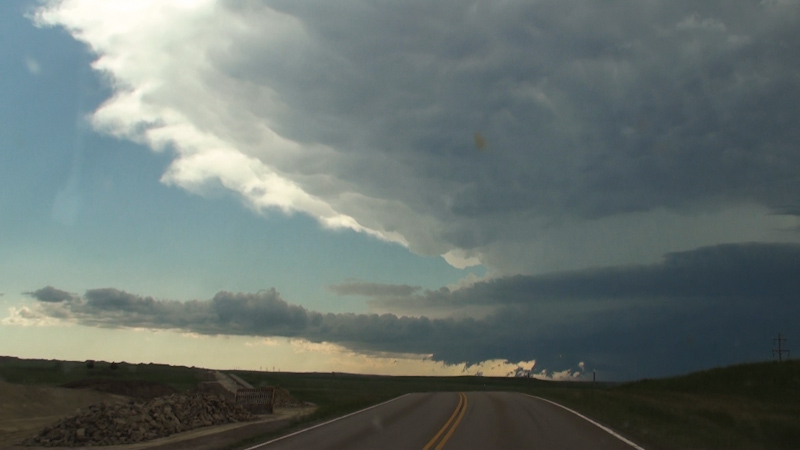 We followed the storm into position as our road turned northeast, again recording impressive structure and large fractal developments on the leading edge of the forward flank downdraft. Unlike the earlier point, the storm did not show clear rotating development at the low levels, with no apparent separation of an RFD plume. Continuing east to Jordan where we met with Skip and Anton’s vehicles, we fueled up before pressing on east ahead of the accelerating storm. After briefly losing structure, the storm tightened up into an impressive supercell with spectacular inflow banding and laminar surfaces, which Jenn suggested looked very much like Ursula, with upper tendrils resembling black octopus legs very strongly. 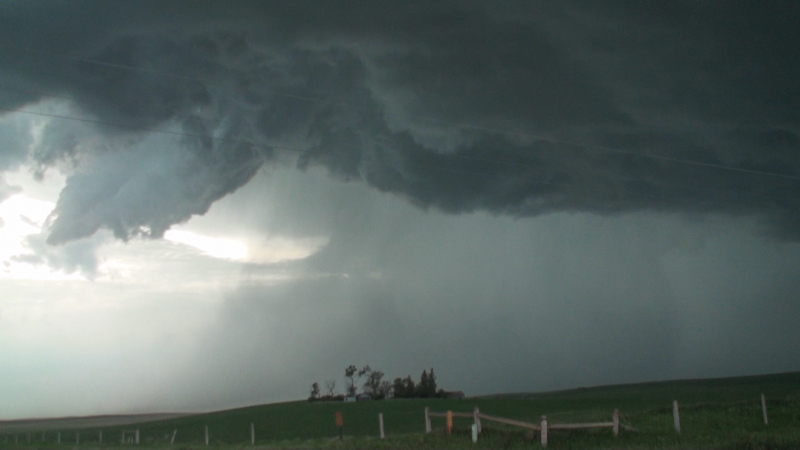 At several stages the cell showed strong rotation and was tornado warned, however we did not witness any tornadoes. Nonetheless, we continued to track the storm east to Circle, and then chose to take the southeast route to Glendive as the storm began to turn southeast and accelerate to over 40kts. 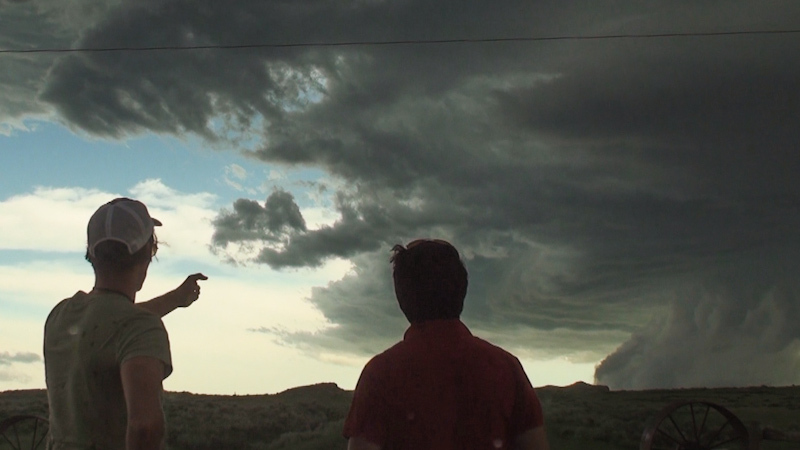 Arriving at Glendive, we elected to stop under a gas station awning as there was no way we could outrun the storm to the southwest on the interstate, and given its lack of tornado potential and the possibility of a hail dataset, we positioned for PIV. The storm took on an ominous structure as it closed on Glendive, but ended up tracking slightly southeast of our position, with hail in our area being limited thus to half dollar size. Tracking along the interstate, we sampled at several locations the hail that had fallen, with a prompt transition from quarter to golf ball and then to two inch stones in quite regular frequency closer to the southern side of the updraft base's passage. While baseball hail was reported, no data could be obtained that approached this size, suggesting the report was potentially overestimated, which was further corroborated by local reports of no larger than tennis ball sized hail. 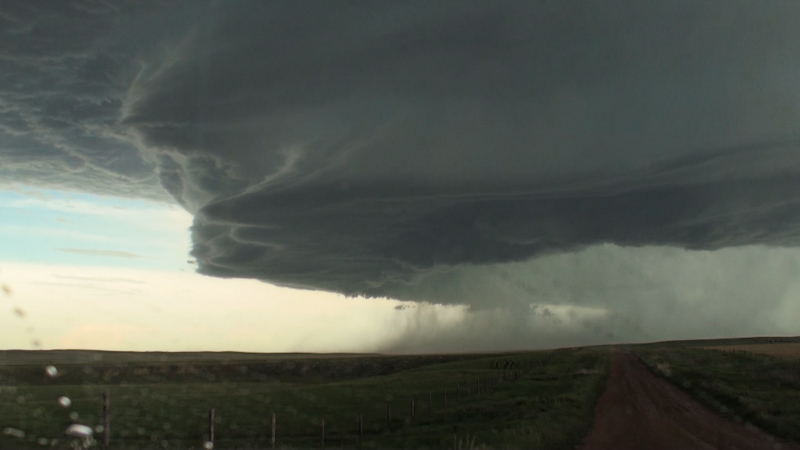 In all, we were on the same supercell for six hours, and saw many different morphologies it produced - a very enjoyable experience. We then drove west toward our hotel and the approaching embedded supercell and linear structure, hoping for a last chance on a tail end charlie storm. However as the cap began to strengthen, these storms weakened but still were capable of producing impressive lightning and intense sustained wind gusts that blew our three tonne car all over the road. The setting sun provided some pretty viewing through and behind the storms, particularly where we transected through the southernmost cell. " Although we still hadn't gotten our tornado shot, the gorgeous supercell and dramatic dust storm encounter more than made the chase for us. This was my first serious venture into Montana for chasing as well, having only briefly crossed the state line the year before Meanwhile, the Saskatchewan storms went up as forecast, but also failed to produce tornadoes, so we wound up not missing anything either. Wear goggles and use the vehicle to block the wind if you're going to be outside in a dust storm.